Our goal is to provide you with the highest quality of care in a compassionate and safe environment. In order to do this, we use the most current periodontal procedures, instruments, medications, and sterilization techniques. Every procedure is done with your comfort and safety in mind. We work closely with your general dentist to ensure you get the best possible care. We want you to be completely informed of your condition and encourage you to ask any questions you may have regarding your treatment and care. Please feel free to ask questions before, during, or after any of these procedures. If you have a broken or badly decayed tooth, your dentist or periodontist may recommend crown lengthening in order to make getting a filling, crown or bridge possible. When getting a new crown or bridge, your dentist must prepare your tooth to receive the crown. Sometimes there is not enough tooth structure above the gum line to accept a new crown. Crown lengthening provides more tooth structure above the gum line. 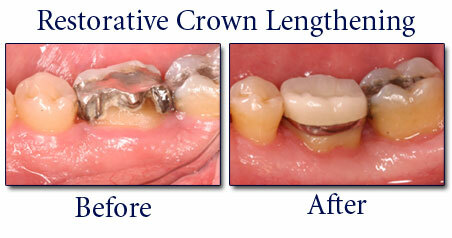 When crown lengthening is done for this purpose, it is called “restorative crown lengthening”. Procedure: The periodontist administers a local anesthetic and recontours excess gum and bone tissue to expose more of your natural teeth. This can be done to either prepare your teeth for a crown or bridge or a filling. Crown lengthening can enhance the esthetics of your smile. It can create a more even gum line or make your teeth appear longer. It can also make some dental procedures, like crowns or bridges, possible by providing more tooth structure for the crown or bridge to rest upon. When crown lengthening is recommended for a large cavity or broken tooth, it usually means the tooth can not be restored or saved with out more tooth being exposed, so the bone and gumline is reduced to expose more solid tooth structure. Crown lengthening can also result in less gum irritation from an existing filling or crown that is too deep under the gum line. The before picture is a lower 1st molar with a large silver (amalgam) filling. A large section of the tooth on the tongue side fractured off below gum line. 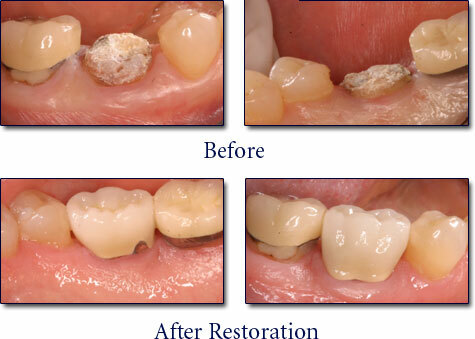 The dentist could not restore it adequately with a new crown without having more solid tooth structure exposed. The after picture is with the new crown in place 3 months after the restorative crown lengthening surgery was done. 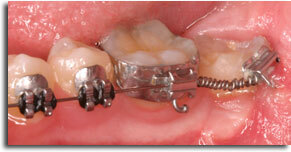 The restorative crown lengthening procedure made it possible for the dentist to save the tooth. The left photo shows the lower 2nd molar (bottom back tooth) is badly broken on both the cheek and tongue side. The center photo is 10 weeks after the crown lengthening surgery. 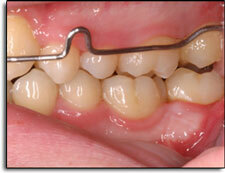 The right photo shows the tooth with a new crown placed 3 months after the crown lengthening surgery. Restorative crown lengthening surgery was done to expose more tooth structure. This is the result. 4 months later this woman's family dentist was able to make a crown, saving a tooth that she thought had to be extracted. The left photo shows a molar decayed and broken extending under the gum line, making it impossible to restore. The right photo is 8 weeks after the crown lengthening procedure. Note the decay and break are now above the new gum line, making it possible for the dentist to remove all the tooth decay and prepare the tooth for a crown. You may have asked your periodontist about procedures to improve a “gummy” smile, where your teeth appear short when smiling. Your teeth may actually be the proper lengths, but they are covered with too much gum tissue. You might also have an uneven gum line that detracts from the esthetics of your smile. In both these cases, your periodontist can perform crown lengthening to enhance your smile. 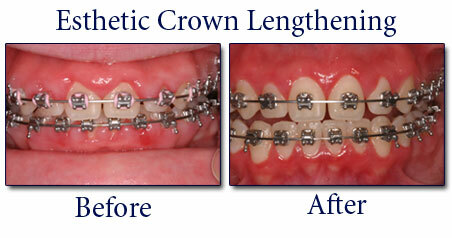 When crown lengthening is done to enhance the esthetics of your smile, it is called “ esthetic crown lengthening”. Procedure: The periodontist administers a local anesthetic and recontours excess gum and bone tissue to expose more of your natural teeth. This can be done to either prepare your teeth for a crown or bridge or to improve the esthetics of your smile. Esthetic crown lengthening can enhance the esthetics of your smile. It can create a more even gum line or make your teeth appear longer. It can also improve ability to eat, as well as allow better oral hygiene and result in less gum irritation. This is a teenage orthodontic patient who developed excessive gum overgrowth as a result of ineffective oral hygiene during braces. In the Before photo, note the overgrowth of gum tissue around both the upper and lower teeth. The arch wires were removed, local anesthetic given, and the gums were reshaped using both a surgical blade and a Luxar LX20 carbon dioxide laser. The After photo is 3 weeks later. This is a teenage orthodontic patient who developed excessive gum overgrowth as a result of ineffective oral hygiene during braces. 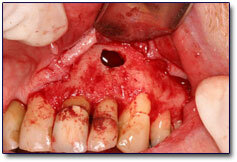 The gums overgrowth subsided somewhat after the braces were removed, but would not improve any more than this. In the Before photo, note the overgrowth of gum tissue around both the upper teeth. Local anesthetic was given and the gums were reshaped using both a surgical blade and our Luxar LX20 carbon dioxide laser. The After photo is 4 weeks later. This is a Before photo of a teenager that has some gingival overgrowth, making it harder to clean her teeth leading to reduced oral hygiene, as well as an esthetic issue. The gums were reshaped with both a surgical blade and Luxar LX20 carbon dioxide laser. The After photo is 2 weeks later. The above patient had veneers planned, but his dentist needed the teeth "longer" and evened out to get an excellent esthetic result. 1st, Dr. Sebastian did an esthetic crown lengthening procedure. 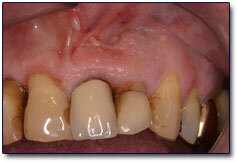 2 month later, the restorative dentist placed veneers, obtaining an excellent esthetic result. Soft tissue grafting is available to stop further dental problems, gum recession, and/or to improve the esthetics of your gum line. When your gum recedes it exposes tooth roots. Exposed tooth roots are the result of gum recession. Your gums may have receded for a variety of reasons, including aggressive tooth brushing, the alignment of the teeth, orthodontics, heredity or periodontal disease. You may not be in control of what caused the recession, but your periodontist can help you identify the factors contributing to the problem. A soft tissue graft procedure can repair the missing gum and help to prevent additional recession. Dr. Sebastian has done advanced training in soft tissue grafting to ensure that he can offer you the highest standard of care. Procedure: The periodontist administers a local anesthetic, prepares the area, and then places a gum tissue graft. This can be done for one tooth or several teeth. The main purpose of a soft tissue graft is to reduce the likelihood of further recession and bone loss. In some cases, it can cover exposed roots to protect them from decay. Exposed tooth roots can be sensitive to heat, cold and sweets. This can result in discomfort when eating different foods. 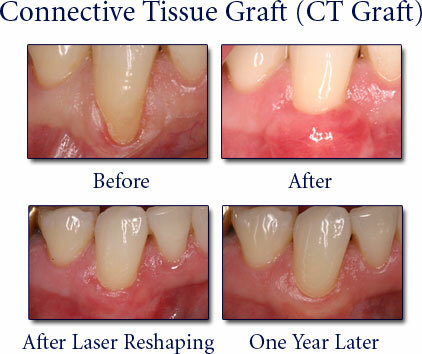 In many instances soft tissue grafts, called Connective Tissue grafts (CT grafts) can attempt to cover these exposed roots and reduce the sensitivity to heat, cold and sweets and may improve the esthetics of your smile, as exposed tooth roots may look unsightly. There are 2 basic types of soft tissue grafts. One is the Free Gingival Graft (FGG), which has been a common gum surgery since the 1940’s. With an FGG, the primary objective is to remove the existing gum around an affected tooth/teeth and replace it with a firmly adhering gum tissue, the donor source being a thin piece of gum from the palate (the roof of the mouth). There is no attempt to cover the exposed roots. This is the most common type of soft tissue graft and is the easiest and fastest to do. It also heals the fastest. When it heals it has a “patch” appearance. There are instances where this is the graft of choice, such as in the case of extremely thin existing gum in the lower front teeth, on the tongue side of the lower teeth (poor access for the other types of soft tissue graft), existing fillings on the roots of the affected teeth (soft tissue grafts will not cover or adhere to filling materials), or roots that have excessively worn in “divits”. This is an example of an FGG. These are all examples of a Free Gingival Graft (FGG). As you can see in the before photos several of the lower front teeth had paper thin gum that was starting to recede. Donor tissue from the palate was used as the graft tissue to reinforce the gum with a tightly adhering gum tissue that should resist any further recession (and subsequent underlying bone loss) from occurring. The after photos were taken 4 weeks after the grafts were done. The 2nd type of soft tissue graft is a Sub-epithelial Connective Tissue Graft, commonly shortened to Connective Tissue Graft or a CTG. The CTG was developed by Dr. Burton Langer of New York and described first in a published article in 1981. CT grafts take longer to do and are much more technique sensitive, requiring more advanced surgical skills. The purpose of a CTG is 3 fold. 1st is add a firmly adhering gum to prevent further recession, 2nd is to attempt to cover the exposed root, and 3rd is to get a better esthetic result, as it does not result is a “patch of gum” appearance. While the CTG is the “ideal” graft as compared to the FGG, there are instances mentioned above that would make doing a successful CTG difficult. In addition, while total root coverage is the ideal outcome, sometimes only partial root coverage can be achieved. We refine the majority of our CT grafts about 3 to 4 months post-op with our Luxar LX20 carbon dioxide laser to reshape them for achieving the best esthetic result. Below are 2 examples of CT grafts. This is an example of a CT graft. Note that the lower cuspid was prominently positioned in the arch, leaving very thin existing gum that eventually started to recede away. The middle photo was taken 6 weeks post-op. Laser reshaping was done 4 months after the initial graft procedure. The bottom left photo is 1 month after the laser reshaping. The gum was receding on the prominent root of this molar. When the crown was originally placed several years before, it was made to the then existing gum line. A CT graft was done to place a thicker amount of firmly adhering gum taken from the palate that should prevent further significant recession from occurring in the future. In addition, coverage of the root was obtained. The after photo was taken 4 months post-op and 1 month after refinement with a carbon dioxide laser. This is a gorgeous post-operative result. 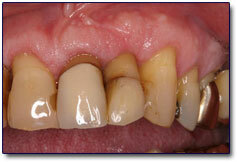 The before photo shows several millimeters of gum recession and root exposure. The after photo is 15 months after the CT graft was done, showing the root remaining covered. CT grafts are not "short-term" root coverage procedures. Sometimes when you lose one or more teeth, an indentation can occur in your gums and jawbone where the tooth used to be. This happens because the jawbone recedes when it is no longer holding a tooth in place. Not only is this indentation unnatural looking, it can cause the replacement tooth to look long compared with the adjacent teeth. A periodontist can fill in this "defect" using a procedure called ridge augmentation. This recaptures the natural contour of your gums and jaw. A new tooth can be then created that is natural looking, easy-to-clean, and beautiful. Procedure: The periodontist administers a local anesthetic and then fills the sunken area with grafting material, securing the tissue into place. In some cases, irregular surfaces of the damaged bone are smoothed. This allows the gum tissue to have a better, more natural appearance. 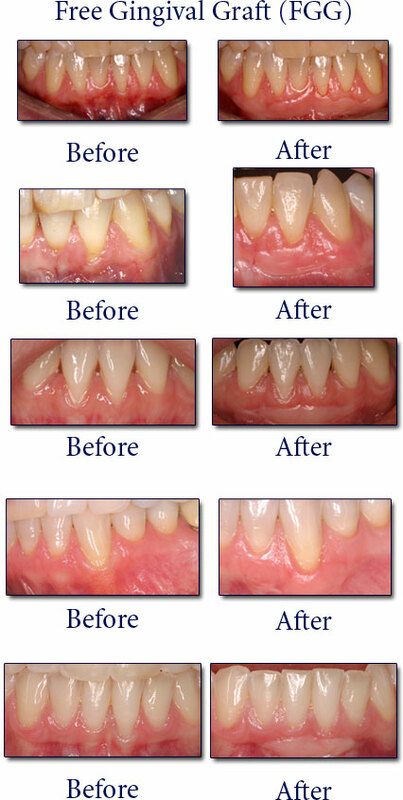 Ridge augmentation can improve the esthetics of your smile. It can also make the new tooth that replaces the lost tooth easier to clean, as well as making it look more natural. Occasionally people develop lesions of the gum tissue or of the jaw bone around the teeth. Lesions can be benign (non-cancerous) or malignant (cancerous). A definitive diagnosis is obtained through a biopsy specimen being sent to a pathology laboratory that specializes in oral lesions for analysis. We do not treat malignant lesions here. These are referred to an oral surgeon or ENT physician. 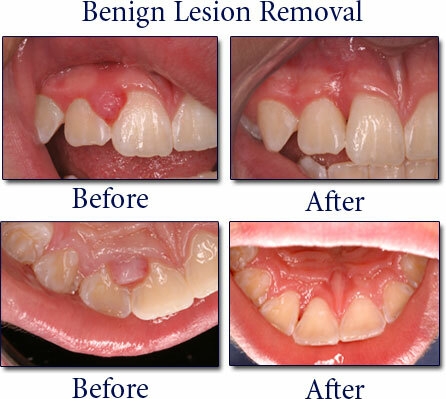 Fortunately most intra-oral lesions we see are benign. 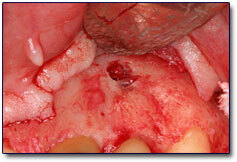 The before photos above show a benign lesion of the gum tissue in between the teeth called a pyogenic granuloma. Using local anesthesia, the lesion was excised and sent for a definitive diagnosis to a pathology laboratory that specializes in oral lesions (University of Washington Oral Pathology Department). The after photo was taken 3 weeks later. The above photo shows a normal appearing gum. Note, though, at the x-ray reveals a large radiolucency (dark circle). Years earlier, this person had an infected tooth that needed a root canal. The infection cleared, but the subsequent cyst did not clear up, but rather grew bigger. There was not pain associated with this growing lesion, and it was identified on an x-ray as part of a routine check-up. Top row — left photo shows small hole in the bone the cyst had created. The right photo shows the cyst being removed. Bottom row — left photo shows the bone void once the cyst was totally removed. 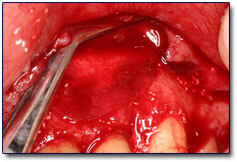 The right photo shows a bone graft placed in the bone void to get bone to re-grow. Luckily, the biopsy report revealed the lesion was aggressive, but benign. The left photo shows a thin resorbable collagen barrier to hold the bone graft in place inside the void. The right photo is the area sutured. The above left photo was taken 6 weeks later. The above right x-ray was taken 17 months later, showing resolution of the cyst and re-growth of the previously destroyed bone. Sometimes there is a prominent frenum that needs reduced or excised away. In the above case, before orthodontics was started, the 2 upper front incisors had a diastema (separated front teeth like David Letterman) with the frenum extending between the teeth. When orthodontics pulls the 2 teeth together, the frenum bunches up and will re-separate the teeth once the braces are removed, unless it is excised away. The norm is to do the orthodontics until near completion, then excise the frenum away (frenectomy) and is very successful. Doing the frenectomy initially before orthodontics will create a scar that will also tend to spread the teeth apart. Above left shows the upper anterior prominent frenum just before excision (frenectomy) and the right photo was taken 10 weeks later. Sometimes teeth do not erupt through the gum tissue on their own and they need to be exposed as part of orthodontic treatment. The above photos show an impacted mandibular 2nd molar in a teenager undergoing orthodontics. He was referred to Dr. Sebastian by his orthodontist to have the impacted molar exposed. Using local anesthetic (commonly called novocaine) the gum was reflected, trimmed and sutured lower so that the impacted tooth was exposed . He then went immediately to the orthodontist to have an orthodontic bracket placed. This photo was taken 7 weeks later and shows the tooth with the orthodontic bracket and wires in place beginning to move the tooth. This photo was taken 1 year later at the completion of orthodontics. The above photos show an impacted lower right cuspid in a patient undergoing orthodontics. He was referred to Dr. Sebastian by his orthodontist to have the impacted cuspid exposed. This is a pre-operative photo and x-ray. The above photos were taken at the time of the exposure, 1 week after and 4 months after. Sometimes the back molars come in and the gum tissue over them is thick and does not recede out of the way, as normally occurs. Closing the teeth together, eating, etc., can be difficult and painful. Food also has a habit of getting stuck under the flap of gum tissue. The infections that result (pericornitis) can be painful, as the swelling makes it impossible to close the teeth together and chew food without causing the opposing tooth to "chew" into the swollen gum. Most patients we see with this are in their early teens. If the tissue overlying the tooth is small, it is called an operculum, and its removal is referred to as an operculectomy. If the tissue is large, it is referred to as pericoronal gingiva, and its removal is referred to as excision of pericoronal gingiva. Above is an example of an operculum that was removed with use of a laser. 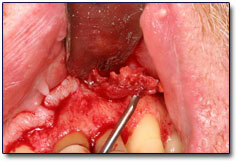 Above is an example of pericoronal gingiva that was removed with a combination of surgical excision and laser.